When Daisy turned 1 in September, I went through Baby Box. I arranged some photos of my pregnancy and Daisy through the year, collected a few crafts we (or really I) made with her little finger and footprints, and saved my most favorite of her tiny newborn clothes. The whole process is very bittersweet. You love seeing your baby grow, learn, and become a real person, but miss the tiny baby sounds and snuggles of infancy and wish time would slow just a little. I did the same with Jack. Their boxes are very much the same, except Daisy’s has a notable addition I wish I had for Giacomo’s. When Daisy was a newborn, we made her a Baby Guest Book. When Giacomo was born, I took photos of him with every person who came to visit. 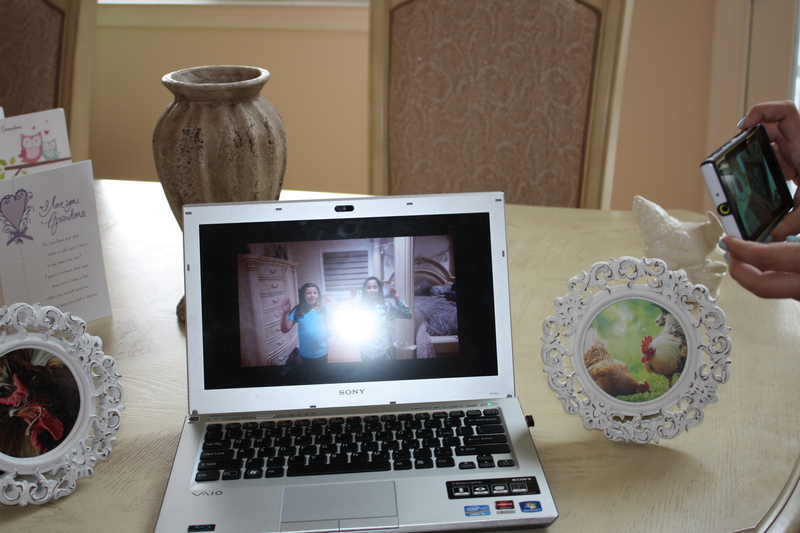 Those photos were taken with my nice SLR camera and are saved out in the digital world. I did the same with Daisy, but I took it one step further and made the guest book by taking photos with a Fujufilm Instax Mini I borrowed from my niece for an instant picture and having each visitor write a little message for her. Some messages were as simple and sweet as “welcome to the world. I personally loved when children visited and left doodles (including a traced foot) and cute messages like “nice to meet you.” Then there were the longer notes that brought tears to my eyes, and one day they’ll do the same for Daisy. My family is big, so the books filled up quickly and now Daisy has a tangible (not digital) keepsake from each visitor she had the first few days she was born. I wanted the photos to be protected by a cover sheet, so I bought 2 small 4×6 photobooks from Micheals. I cut white cardstock to 4×6 squares and filled each page with a blank square. After each photo was taken, I attached it to a 4×6 square with photo corners. Because the Instax photo is so small, there was ample room for a message next to the photo. I knew Daisy was going to be a girl and her name would be Daisy, so I designed the book covers to reflect her name and added some daisy stickers to the pages. For this baby, I will make the cover after we are home. I’ll also add some colored paper and maybe some decals within the book. I got the idea from one of my girlfriends. Her book is styled a little differently than mine, but anyone can take the guestbook and run with it however s/he wants. For example, my girlfriend used a pretty journal instead of a photobook so the person writing had more space (and lines) for a message. I went to Micheal’s yesterday to get the materials for the books, and there are TONS of options for personal journals and books that can easily be used for this, so head out and make your keepsake! by Angela in Crafts and DIY, Cricut Crafts, Gifting Crafts, Mommyhood, Uncategorized Tags: Crafts for Gifting, crafty, Cricut, DIY, easy crafts, new baby! I went on a bit of a shirt making kick. I made maternity shirts, the baby shirts, and shirts for my husband, father, father-in-law, and brothers-in-law for Father’s Day. I learned quite a bit making them, and I like how they all turned out. I made the baby a shirt for the 4th of July and a Finding Nemo inspired shirt, even though we probably won’t get to the movies to see Finding Dory with him. I also went a little crazy with Maternity shirts. I also made use of some glittler iron-on material I had for my heart and NJ shirts. My favorite is the watermelon shirt. The watermelon is in the Simply Charmed cartridge for Cricut. I even made a Goonies shirt for my future little Goonie. I downloaded The Goonies font on Dafont. I think that one is Jack’s favorite. I created the Hockey Dad silhouette in Photoshop and uploaded it to design space. It’s my favorite! For the vintage looking dad/grandpa shirts, I found the Marcelle Script font on DaFont.com. It downloads with letters and different style swooshes. The thing with making freezer paper shirts is that it is really annoying putting all the tiny pieces in the proper place. (Especially with the “worn vintage” look of Marcelle Script, as well as characters like e, o, g, p, a, 4, 8, etc). When working with vinyl, most people usually use contact paper, plastic sticky paper used to line shelves, to transfer my cuts onto the surface. The problem is freezer paper isn’t actually sticky like vinyl. You have to iron the freezer paper onto the shirt for it to stick. Heat + plastic = bad, so contact paper is out. Transfer tape is actually made to transfer vinyl to walls and objects, but a lot of brands are also plastic. I wasn’t sure if transfer paper would word or if the glue would ruin the shirts, but I figured I’d test it out and see. I made sure to get transfer paper made out of actual paper, not plastic. 1 I cut the designs on the Cricut shiny side down on the mat. 2 I placed the transfer paper on the whole design 3 and rubbed well. 4 Figured out placement of design, 5 Then I ironed the design on low, dry heat. 6 After I removed the tape, 7 I ironed the design again with parchment paper, and it worked like a charm! I was actually able to reuse the tape and transfer the design to 6 different shirts. I am sure I could have transferred more, but I only made 6 shirts at a time. The stickiness tape did not change much either. In fact, the transfers were easier the more I used the same piece. It seems obvious, but I learned that it’s a lot harder to paint on a dark shirt than on a lighter colored shirt. I expected to have to use a few layers of paint for the dark shirts, but not as much as I actually used. I think I’ll stick to painting designs on bright and light colored shirts, and using heat transfer vinyl on dark shirts. Using Acrylic Paints on Clothing: The Best Fabric Medium. I’ve seen so many cute baby and maternity shirts online, but at $15 (on the low end) for something a baby will grow out of so quickly seems like too much for me. But there is some hope for cute onsies! I’ve seen that you can use the Cricut, freezer paper, and paint to create clothes yourself. I’ve never heard of using freezer paper before, and I know paint makes clothes stiff, so I tested out it all out on an old t-shirt before trying it out on baby clothes. You might think that fabric paint is a paint option I’d consider, but it is a little pricey (I’m cheap), and there aren’t nearly as many colors available in fabric paint than acrylic (I love color). Now I know from unfortunate personal experience that acrylic paint will permanently color clothes, but it will make your clothes hard, stiff, and scratchy. So did some research and found that you can add fabric medium to paints so avoid the problem. There are tons of different kinds you can find online, but I decided to go with the 3 I found at Jo-Ann’s so I could use coupons (and not pay shipping). I found 2oz fabric medium from Folk Art ($2.99), Americana ($2.49), and Delta ($2.49). All three had the same instructions: mix one part medium to two parts paint. I made sure to use the same brand of paints for consistency. Using Apple Barrel paints and a plastic spoon for measuring, I made a mixture of each medium in a different color. I put newspaper inside the shirt so the colors wouldn’t bleed through, but you could use cardboard too. I first just free painted a few squares onto the shirt. I tried out freezer paper to see how it’d work. I didn’t use my Cricut to make the stencil for this practice run; I just cut a few diamonds onto the paper. Iron the paper shiny side down onto the shirt. Paint over the stencil, then peel it away after a few minutes. The paint doesn’t have to be dry, just not soaking wet. Now the hardest part of anything you make is waiting. Let the paint dry for 24 hours. After 24 hours, heat set the paint. In order to do this, I put the shirt in the dryer for an hour. You can also do this faster with an iron, but the dryer is easier and you don’t have to worry about the paint bleeding. I wore the shirt after this, and there was a definite winner, but just to be certain I washed the shirt inside out on the delicate cycle, and I was sure to use fabric softener. This softened all the paints considerably. So what’s the verdict? All three paints are wearable, but for a baby onsie I wanted the paint to feel like it wasn’t even there. The Folk Art medium has, by far, the best texture of the three. You really can’t feel the difference between the actual shirt and the painted area. I think for 50¢ more this is the best bet, especially for baby clothes. The Americana Medium worked really well too. The painted area was not scratchy or tough, but you can distinguish where the painted area is on your skin. A lot of store bought shirts feel this way, and it’s not uncomfortable at all. The Americana brand is also cheaper than Folk Art, so if you don’t mind the texture or are wearing an undershirt, this is a good choice also. I did not like the Delta Medium at all. The painted area was a much more stiff and scratchy on your skin. However I was reading reviews for this online, and many people used this medium for outdoor furniture. I could see using this for the cushions or pillows of a patio set, as outside textiles need to be a bit tougher to hold up to the weather. This brand also is often sold in big bottles rather than the 2 oz bottles, so you could use it for larger area projects. So for clothing, this is a definite no, but for outside things, I might use it. My first baby onsie project isn’t perfect, but oh I love it, especially the back (doo-doo)! We have a small red hutch in our kitchen that houses what Matt likes to call UKGs, or Unnecessary Kitchen Gadgets. Some gadgets he just doesn’t understand, like what a baster is. Other gadgets I can’t deny have little use. I don’t really eat grapefruit, so a grapefruit spoon isn’t necessary (let alone 4). But then again one who knows. 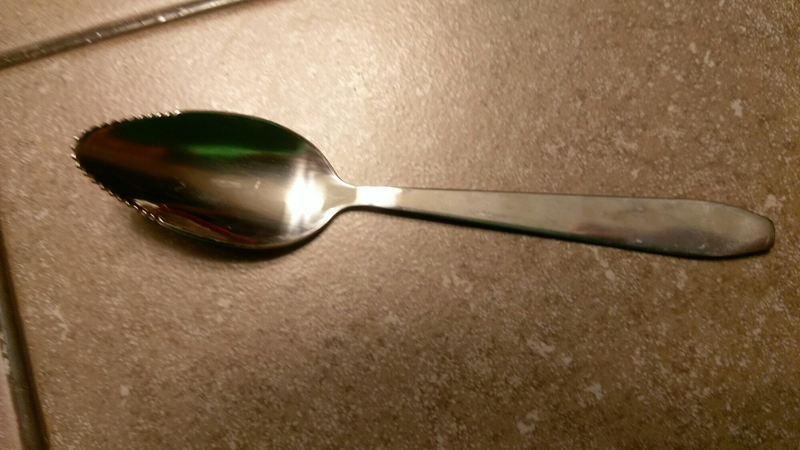 I might use them to scoop out citrus fruits for a salad or dessert or something. But for real I found an extremely necessary gadget this time. 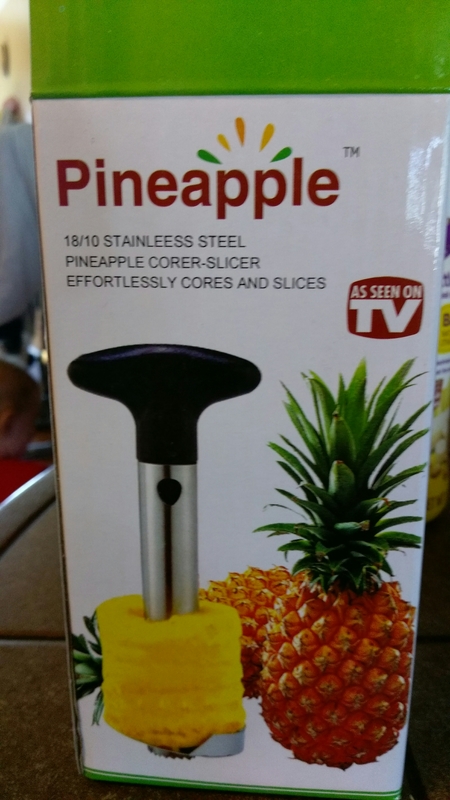 It is a pineapple corer and slicer. 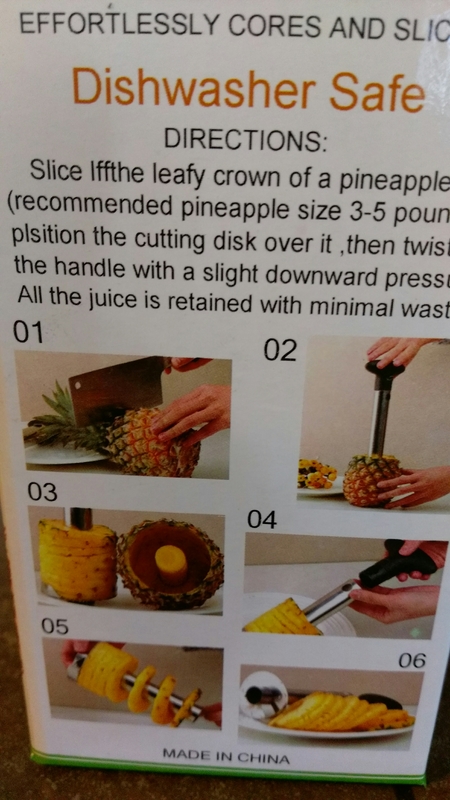 It does exactly that, cores and slices pineapple. OK, so in all honesty I could take or leave pineapple. But you know I’ll be eating a lit more if it with this! 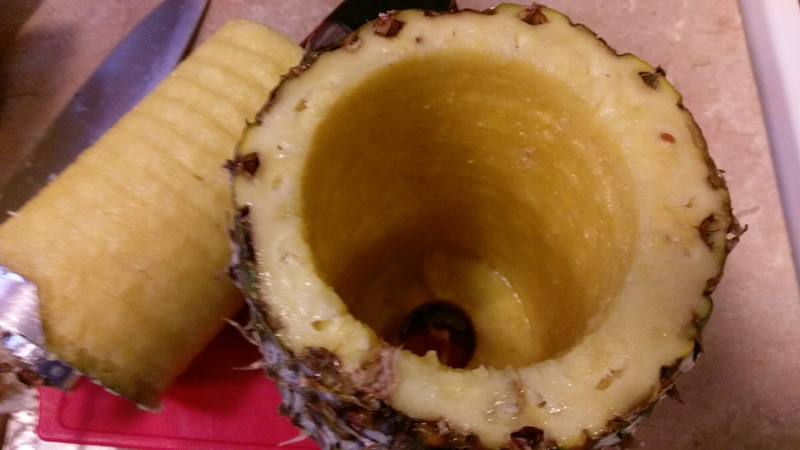 My first time using it I accidentally went all the way through the pineapple, making a hole in the bottom. It wasn’t really a problem, but this summer I’ll need to avoid doing that. 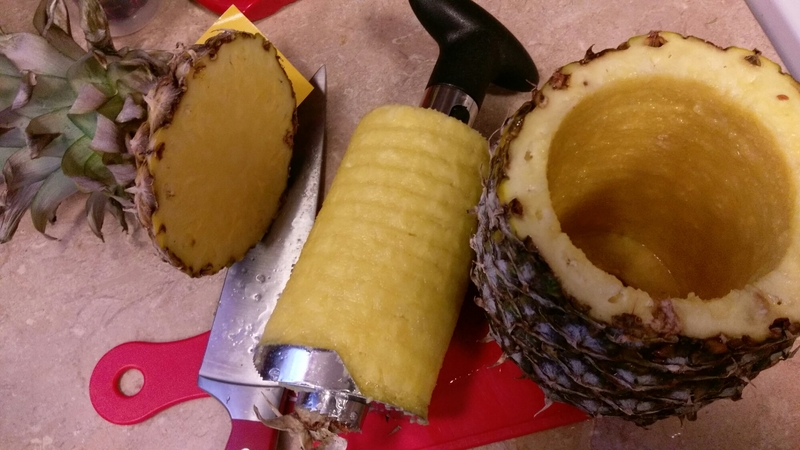 I see myself filling the cored pineapple with some frozen drinks (virgin drinks for me for this summer). I saw this at Bed Bath and Beyond for $20, but then I checked online and Amazon Prime had this one for $6.99! I obviously went for the $6.99 version. I’ve gadgets and gizmos a plenty, and I love them all, necessary or not. I don’t know why, I just do. If you have a favorite gadget, let me know about it! After a break of a few years, we finally resumed our annual President’s Day weekend family reunion ski trip (or, for many of us, sit in a cabin in the mountains and hang our trip). My sisters, parents and cousins rent two side by side houses so we can bounce back and forth from the houses. I used to go snowboarding with my husband several times a winter, but I haven’t been able to since I hurt my knee. I’m so glad that this year all my gear was finally put to use; Matt took my niece Jenna out to try boarding. She had a great time with her dad and uncle on the mountain. 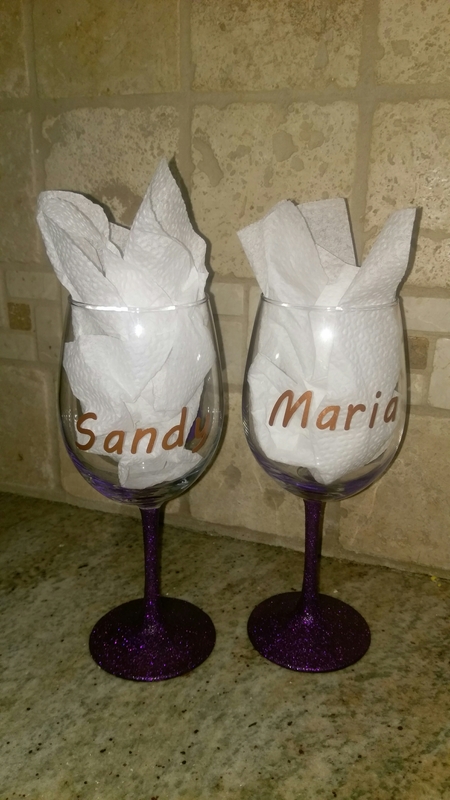 To celebrate the re-start of our festivities, I made some pretty wine glasses for all the ladies in the trip. The glasses are pretty easy to make, and as with anything with glue, the hardest part is the waiting between layers. 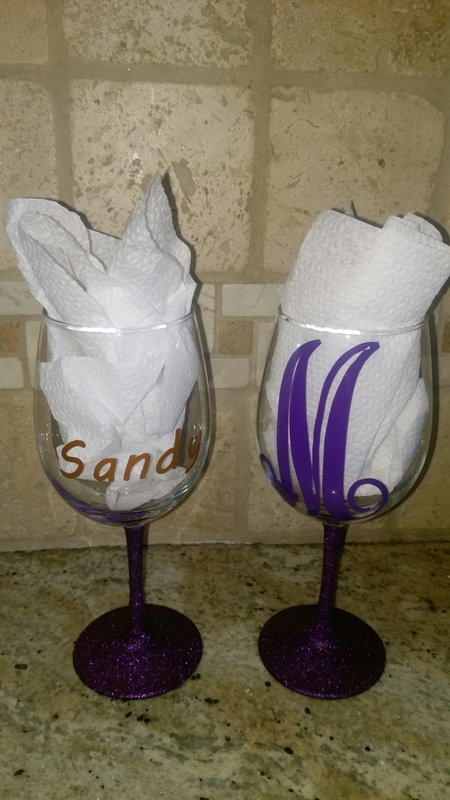 I used the Cricut machine to cut out everyone’s initial and name in vinyl lettering for the wine glasses. I also glittered the stems of the glasses. If you don’t have a Cricut, you can still make glasses with glittered stems. We had a great time, and the glasses were a hit! I wanted contrasting fonts for the monogram letter and the full names, so I went with a full, swirly monogram and a thin, hand written font for the names. I applied the whole name on the glass in gold vinyl in MV Boli (a system font already on my computer). 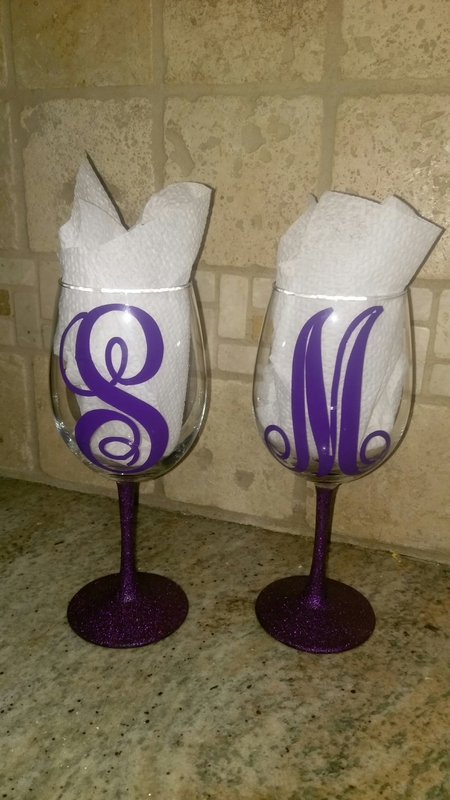 I applied the first initial on the opposite side in purple vinyl (to match the glittered stems) in a monogram font I found on dafont.com called Monogram kksc . You can download the same font here. First, wash and dry your glasses and use rubbing alcohol on the surface of where you are going to apply the glitter. 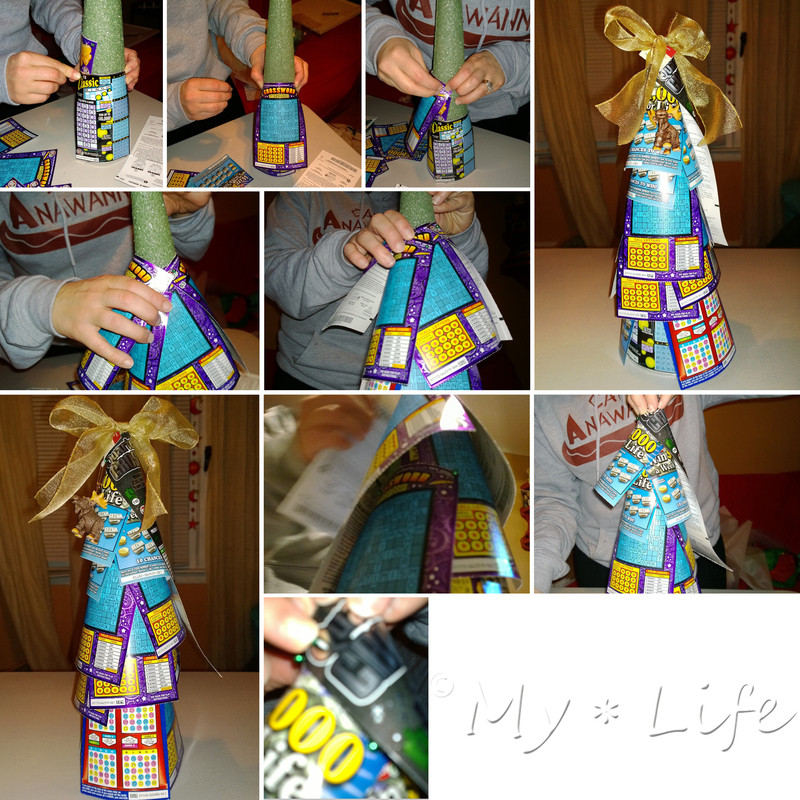 Apply a thin coat of Mod Podge to the stem and base of the glass. Allow to dry for several hours or overnight. You will know the glue is dried by looking at the underside of the glass. If you see any white, the glue is still wet. Apply another thin coat of Mod Podge and reglitter. If you need to, repeat the glue and glitter layers until your desired coverage. I only needed two coats of glitter, but you shouldn’t need more than 3 or 4. When your last layer is dried, apply a very thin coat of Dishwasher safe Mod Podge*** and allow to dry. If you think you need to, you can apply a second coat after the first has dried. ***Many people seal their glitter glasses with Triple Thick. I tried it with my glass, but it reacted with the dark purple glitter I used. I wasn’t sure if I did something wrong, so I asked about it on a crafting group page. Apparently certain glitter brands/colors will muddy and react the way mine did. I really like the feel of the triple thick sealer (it feels more like glass) so I will try to use it with another brand/color of glitter in the future and post if there’s a difference. Jack is on the move! Almost out of nowhere he started crawling and pulling himself up in his crib. As soon as he started, I immediately saw all the dangers in my house that needed to be baby proofed. I ran to Babies R Us, bought just about everything, and spent a weekend altering doorknobs and locking toilets – something I thought was ridiculous in the past, until stories of toilets clogged with race cars and towels were brought to my attention. I baby proofed the whole house, and the only thing I have left is to redesign the items on Jack’s bookshelf. The way they’re arranged now, he can easily pull them off and break them. 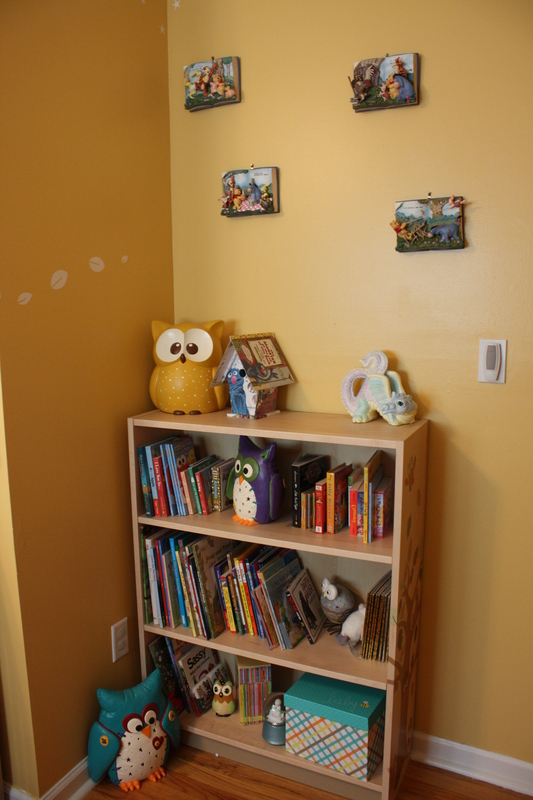 We didn’t know if Jack was going to be Jack or Daisy, so we chose driftwood finish for furniture and painted the room a rustic yellow which goes nicely with the pumpkin butter color of our hallways. I figure we can reuse everything whenever baby #2 comes along. I realize I never introduced you to Jack’s bookshelf or all the work I did in Jack’s room. Initially, it was a craft room/ guest room. Now, guest sleep on the couch, my crafts take over the house, and our recliner rocking chair is no longer in the living room, but that’s OK. One day we’ll figure out where to keep everything. At my shower, I was given an IKEA bookcase that matched his bed set, and it was filled with books from everyone. Santa, the Easter Bunny, and I have since loaded the bookcase up with more books. This is Jack’s book corner. The walls have these cute Winnie the Pooh book plaques my MIL got for her future grandchild years ago (like before we were married). I’m thinking of making some kind of book piece for the adjacent wall. The thing I love most about his room is the tree decal. I ordered it and the window tree decals from TheWhiteTreeStore by LittleLionStudio. The original tree looks like this, but there’s no law that says that’s how you have to apply it. Instead, I made the leaves look like they are blowing away. 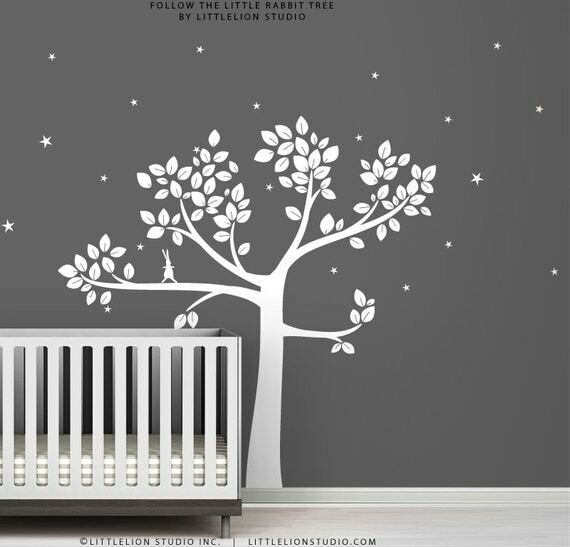 The decals are beautiful and easy to apply, and they really make his room charming. The bed set is forest animals. Jack loves it. He uses the “bedspread” as a play mat, and he loves to talk to and touch the soft wall hangings as we pass them by. It has matching decals, but they were too small for the wall (for me at least). Instead, I used them to decorate his furniture. I used some of them for the sides of this storage bin I use for spare sheets, blankets and other baby odds and ends. I also decked the bookcase out with the rest of the decals that came with his bed set. I think the decals look so charming, and they can easily come off when he’s older. I also decorated his room with my book bird houses. So far I’ve made 3, but I think as he gets older I’d like to make some with his favorite books. In the meantime, I made one with one of my favorite childhood books, The Monster at the End of this Book. My favorite birdhouse, though, is the Peter Pan house. When you open the door, you can see Pan’s tree club house! Good thing I have small enough hands to do it. We have old doors which I thought about updating, but they actually match the style of our house and I’d rather spend the money elsewhere. Above his door is a simple cross, decorated with the finger rosaries I used as a favor at his christening. Next to his bed is a canvas quote I made using my Cricut and love best of all. Now that you’ve toured Jack’s room there are a few things you should know. Every baby list will tell you about things you need for baby’s room, but here are the 3 things I always keep in here that weren’t on any list. 1) Extra blankets behind you on your chair. Babies spit up, and sometimes you don’t even realize it. Don’t ruin your furniture. Drape some receiving blankets over the backs of your chairs. 2) A Rubbermaid bin. Jack grows so quickly and sometimes it feels like its overnight. I always keep a bin in his room so as I struggle to put on a tight fitting shirt, I can just pack it away into the bin for storage. I used to hid the bin behind the rocking chair, but now I got to lazy for that and it’s out all the time. 3) Tissues and a trash bin next to your chair. This is completely separate from the diaper bin and wipes, and it is essential. I realized their importance the day I got home from the hospital. 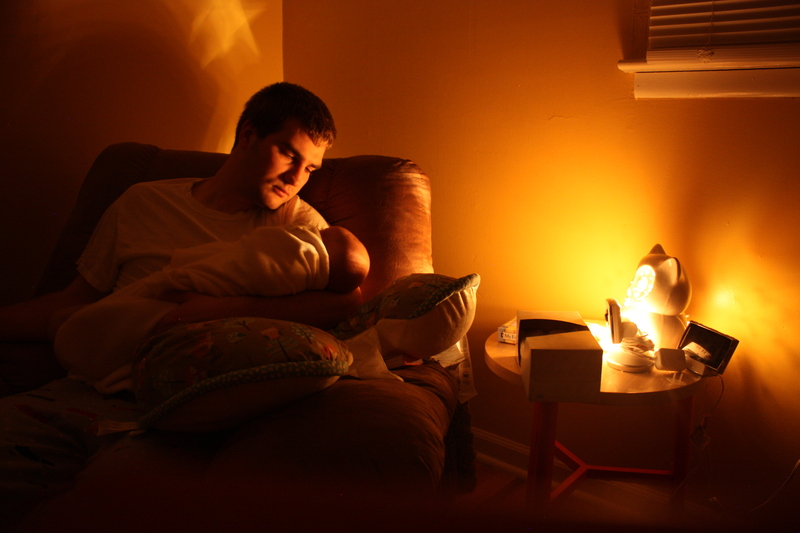 When you bring home your baby, you will cry and for a variety of reasons. Maybe you’re overwhelmed, or maybe you’re insanely happy. Either way, you get home and you have no idea how raging your hormones are. I remember hearing I’d be hormonal and emotional during pregnancy, and I really wasn’t at all. It came after. For me they were all happy tears, and I cried over everything from feeling such deep love for my baby to Suburu commercials. Even reading baby books brought on tears. (Oh my God! He says he loves his puppy! *sob* *sob* That’s so beautiful!) You’re body is going nuts, and there’s nothing you can do about it. Eventually you’ll stop crying and you’ll need those tissues to wipe up baby boogers, but until then wipe your happy and your sad tears, toss the tissue in the trash bin, and if you’re lucky enough to get a colicky baby like me, rock on until the sun comes up. Here are some quick and easy instructions on the diaper bouquet I made a few weeks ago. First, set aside your skewers. You will want most of the skewers full sizes, but make sure to break 4 or 5 skewers in half so you have flowers in varying height. Roll the skewers in green tissue paper. 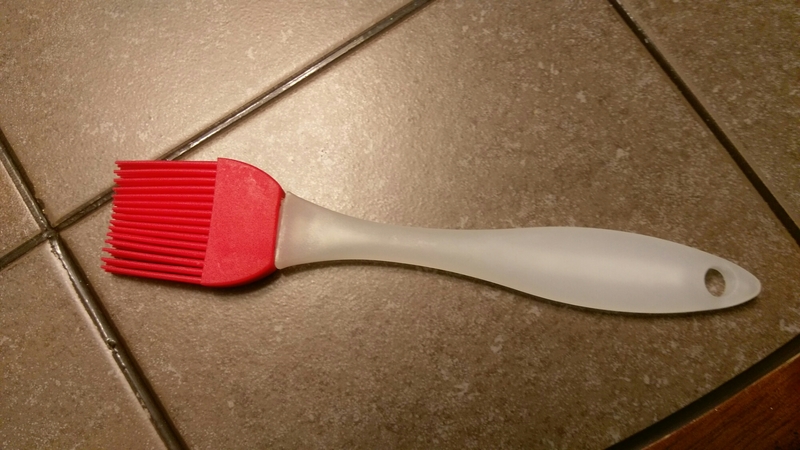 Roll your diaper around the top of the skewer and secure with a rubber band. I like Luvs because they are purple and green, so they kind of look flowery. Now, cut your green tissue paper in long strips about 4″ wide. Lay the skewered diaper on the tissue and roll, being sure to cover the rubber band. Twist the bottom of the paper to secure and, Tada! You have a diaper flower! Now, put some tissue paper in the jar so you don’t see the sticks, and arrange your flowers. For a finishing touch, use some tissue paper to fill in space and make some flowers. I’ve used dark pink for a girl baby and orange for a boy. Just tear the paper into thirds. Now gather in the center fold and twist. It’s a simple flower but it works. Stick the flowers in the open spaces of the bouquet to fill it in. It really is adorable. I used some craft paper in the jar lid as the name tag. I also gave some bath accessories in a regular gift bag, but afterwards I was thinking that with a bigger package of diapers and a bigger vase as a base, I could have put the bath stuff in the vase. Diaper gifts are so useful, especially at 3 am when you’re all out of your regular diaper stash. Really, wipes and diapers are practical and useful, but it does look boring to just wrap up a pack. I like to give a larger size diaper, too. Babies seem to grow out of their size overnight, and it’s nice to be prepared with the next size up. I know Jack was growing so quickly, and it was a Godsend to have a variety of sizes ready. I grew up here, ten minutes from the beach. I can’t imagine having to plan on going to the beach. It’s something I do so casually that I still forget what a special place it is. I usually go to the beach during the week, after work, and alone. We love Island Beach State Park. If you drive past their first two bathing beaches, there is some amazing scenery. I don’t think people realize there is so much beauty right in NJ. Pictures of the walk to the ocean rival some you can find on a tropical island. I love the walk to the ocean. As you walk through the trees and sand, at first all you hear are birds. Then the smell of the ocean comes and you start to hear the sound of waves, and finally you get to the view. When I head to the beach most people are leaving it, so it’s like my own private oasis. I always keep a blanket or chair in my trunk, and if I know Matt will be late coming home from work I just head to the beach and read for an hour or two. But I didn’t really get to do that this summer. I was afraid of going to the beach alone. I’ve never had fainting spells or anything, but I didn’t want to risk overheating by myself while pregnant. I only went to the beach a few times, and I did have to plan around it. It made me appreciate my proximity more. I don’t think I’ll ever want to live far enough away where I have to plan a beach trip. I know that with a baby I’ll have to be more structured with my beach time next year, but I’m glad that if I ever am bored and we have nothing to do we can always walk to beach to pass the time. September is a great time to go to the beach. There aren’t many people and the water is super warm. Matt and I went recently for no reason other than we were bored. We collected seashells, put our feet in the water, and watched as the tiny clams and sand crabs burrowed into the sand. It made me sad that summer is pretty much over. I can still walk the beach in the fall and winter, but it’s not really the same. So I’m going to wear the beach all year long. I made these simple beach bottle necklaces to keep the sand close to my heart. I found a set of tiny bottles at Michael’s. Attach the ring to the cork (You might have t trim the metal with some wire cutters. put some sand in the bottle. It’s easier to scoop the sand rather than pour it. Then I used needle nose tweezers to put in a tiny sea shell, apiece of sea glass, and a piece of faux moss (to look like seaweed). Use some leather cord as the necklace, and you viola! I made a second charm as a message in a bottle. With less sand, I added some small shells, and I wrote a note on a piece of scrap paper (I ripped the paper so the edges weren’t so straight). I realize I could have just scribbled or not have written anything at all, but I like an ocean quote for my ocean necklace. I know it’s there, after all. My message is from Van Morrison’s “Into the Mystic.” I rolled up the scrap and put it in my bottle. How sweet! If you don’t live near the beach, you could make your necklace with sand and shells from your favorite vacation destination and keep it close to your heart too. 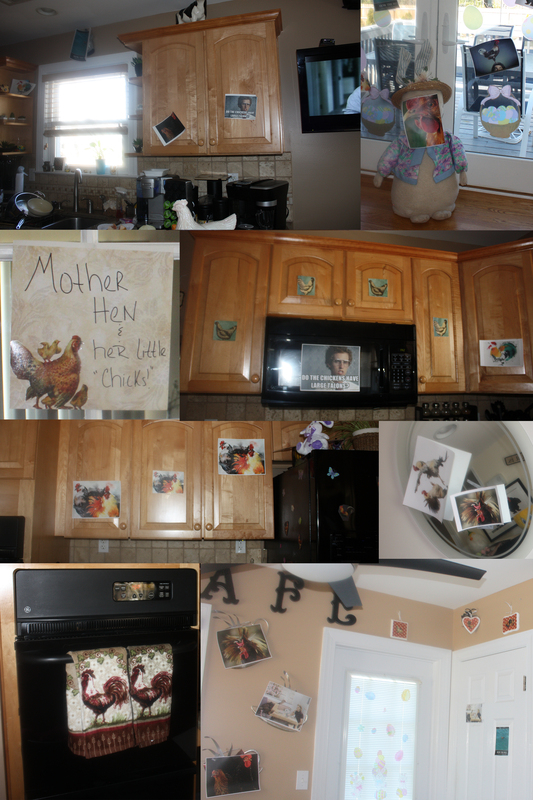 April Fool’s Day/Chicken Day for Mom! In case you didn’t know, one of my many jobs is an English Professor, so I love the fact that April Fool’s Day could be traced back to one of Chaucer’s most popular Canterbury Tales, The Nun’s Priest’s Tale, about a fox who plays a trick on a rooster. You can check out the real version here or the Spark Notes here. 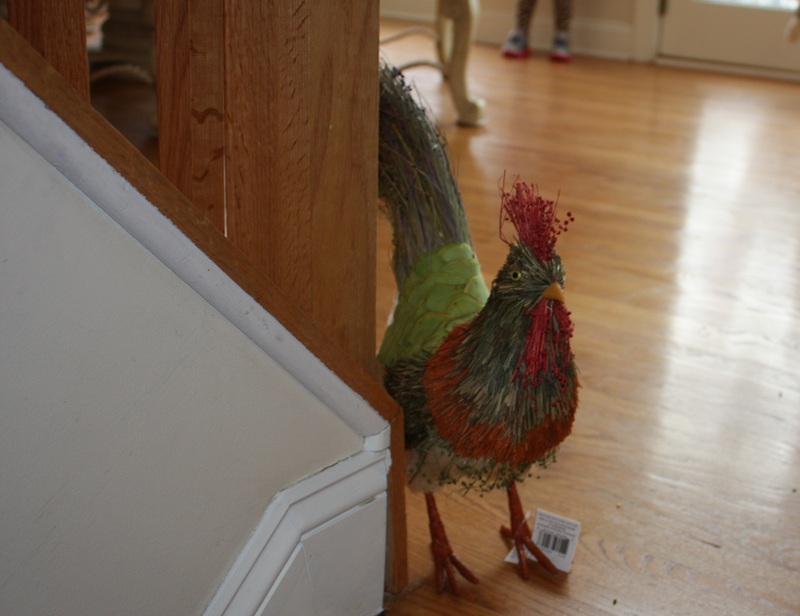 The best part about the fact that the original April Fool’s prank was on a rooster is it perfectly aligns with my April Fool’s joke on my mom. This year, I completely bombed her house with chickens. Giving my mom a chicken has been an ongoing joke between me and my sisters for the past 15 years or so, and not just on April Fool’s Day. Whenever my sister’s an I would go out shopping (a considerably often occasion) we would always ask my mom if she wanted to come. If she didn’t come along with us, she’d yell from her room “No, but bring me back a surprise.” My sisters are very sweet to my mom. They’d always bring her back a cute kitchen decoration, a picture frame, or some candy. I’m a little different from my sisters. I love my mom to bits, and I like to show it by busting her chops. So during one of our shopping trips, I noticed at this particular store, we had already “surprised” my mom with most of the nicer trinkets. Then I saw it. 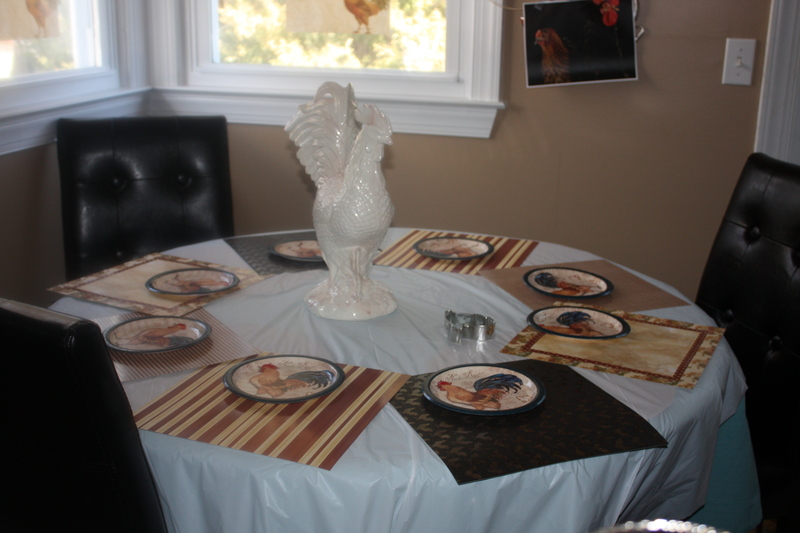 It was the ugliest supposed-to-be-a-chicken-decoration I have ever seen in my life. 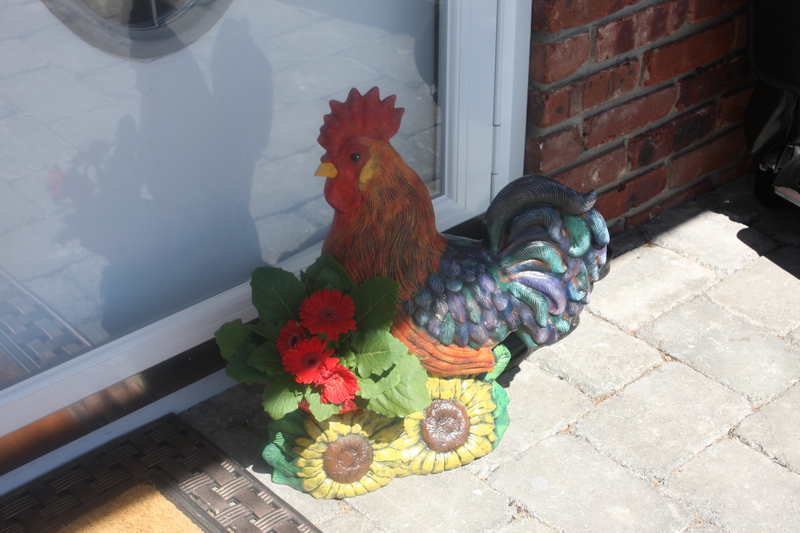 This was no French country style chicken statue or Easter chick. 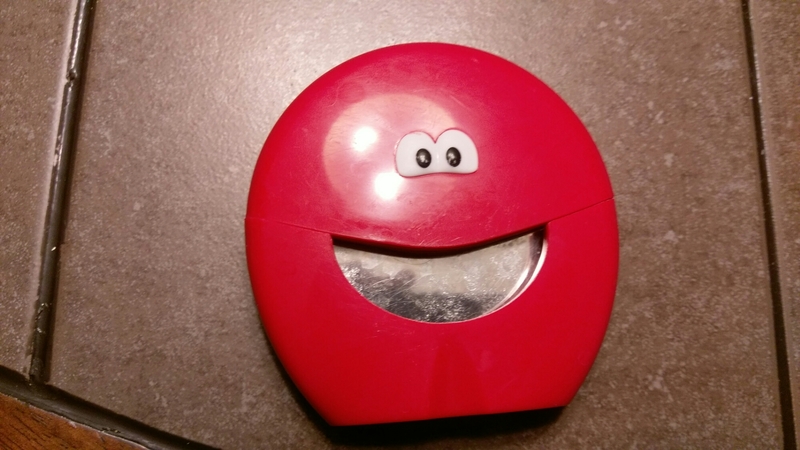 It looked like a 4 year old made it at day care: basically a Styrofoam ball with black and red feathers glued all over it with googley eyes. It was perfect. “She’s not going to want that! It’s ugly,” they told me. 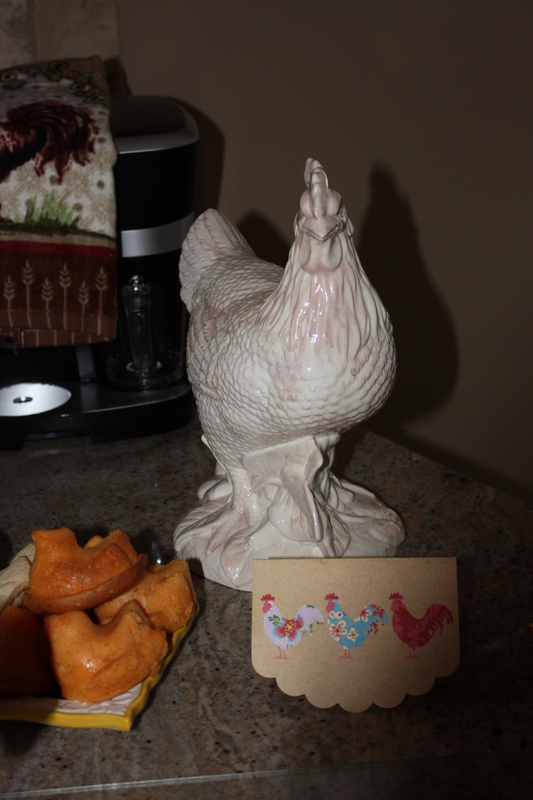 It took a little convincing (and some snacks to make up for the trick), but they agreed to let me get the ugly chicken and present it to my mom. Last year on April Fool’s Day, I was in Home Goods and saw a glass chicken statue and thought “I should get that for mom today!” Then the whole idea struck. 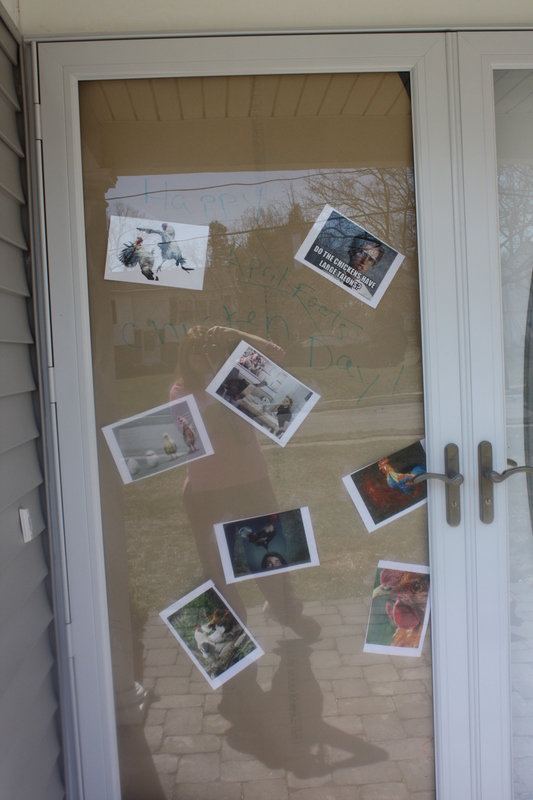 Instead of giving her the chicken that day, I decided to stock up on chickens and roosters and bomb her house with them this April Fool’s. 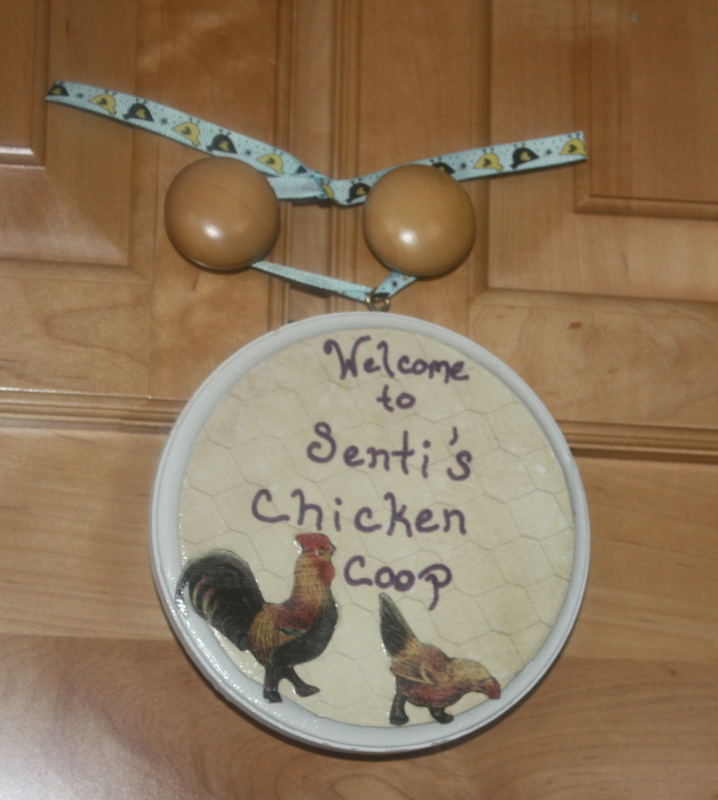 So for the past year, I have been buying, crafting, and stocking up on all the chickens I could find. The chickens took over our spare bedroom. 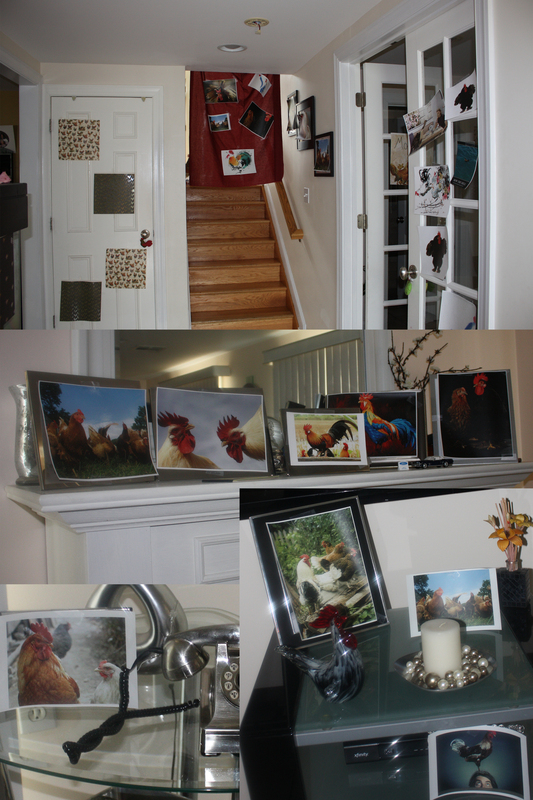 I printed lots of chicken pictures and taped them over all the pictures in the house, and I took video of our family doing the chicken dance and played it on loop in the living room. 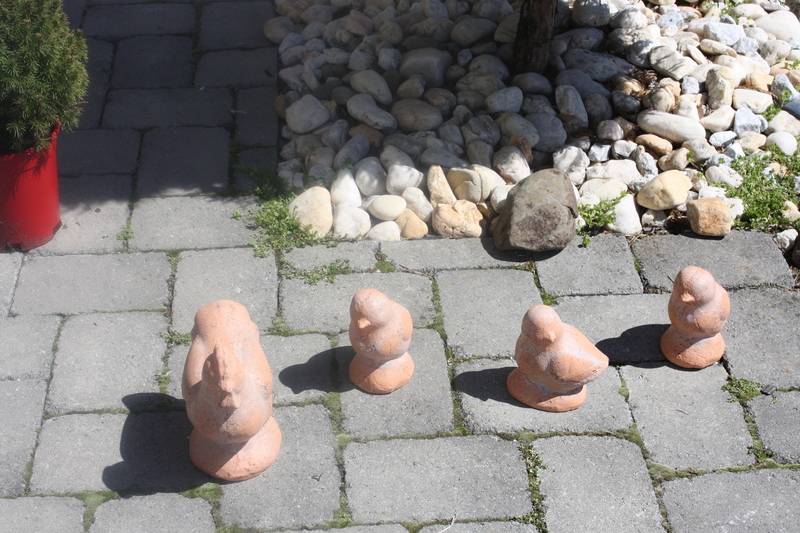 I put some chickens outside. I made this planter at ceramics. 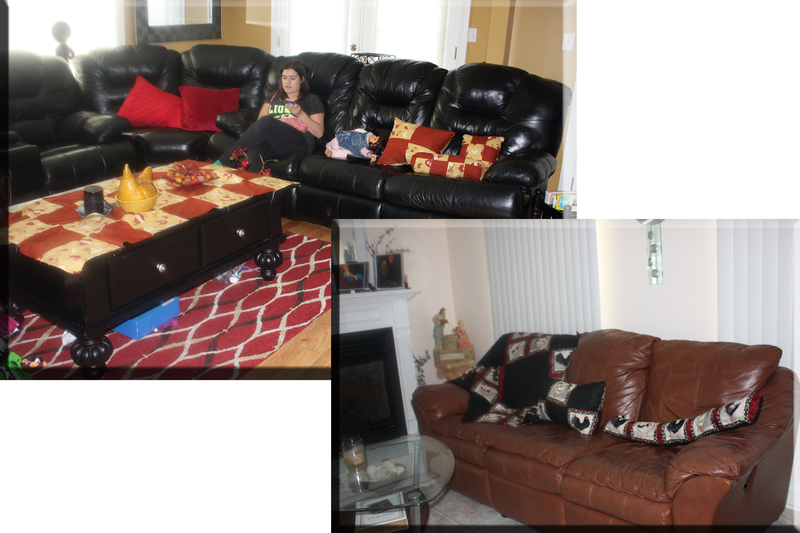 I even made some chicken quilts and pillows for both living rooms. And as much as I’m teasing, it’s all in fun. 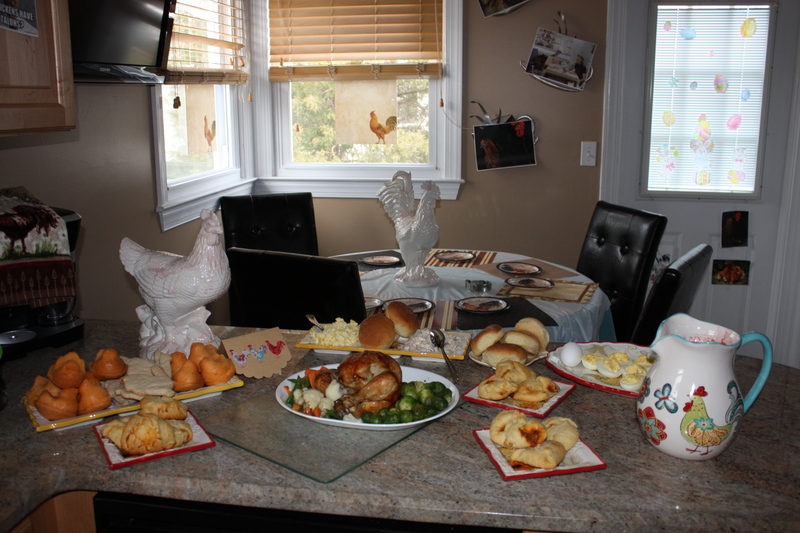 To us, food is love, so along with my chicken house bomb, I made everyone lots of chicken themed dishes. Egg salad, chicken salad, deviled eggs, rotisserie chicken, chicken bites, chicken shaped cookies, and chicken cakes. When I was getting some things ready for the Chicken Bombing, some people asked me if my mom would get mad. I’m glad I have a mom who can take the joke, because it seems like it’s a rarity. The amount of people who were sure my mom would be furious about the prank made me appreciate her sense of humor. I knew she would pretend for a half a second that she was mad, but I knew wouldn’t actually be upset. I was right. She thought it was hilarious. She didn’t even want me to take everything down just yet. I wrapped all my gifts this weekend with the help of my friends Sara and Meg. We painted, stamped, and ribboned the massive amounts of brown paper I have for some really pretty wrapping paper. The last person on my list was Dad. Nothing like waiting for the last minute! My Dad insisted he didn’t need or want anything for Christmas. I wasn’t totally stumped, though. 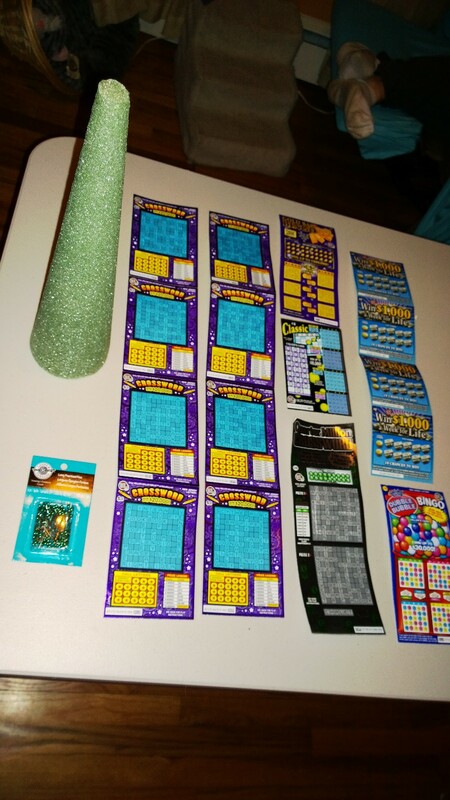 He LOVES his scratch off, so I knew they’d be a perfect gift for him. I didn’t want to just stuff the gifts in a bag with some tissue paper when I wrapped everyone else’s so so beautifully. 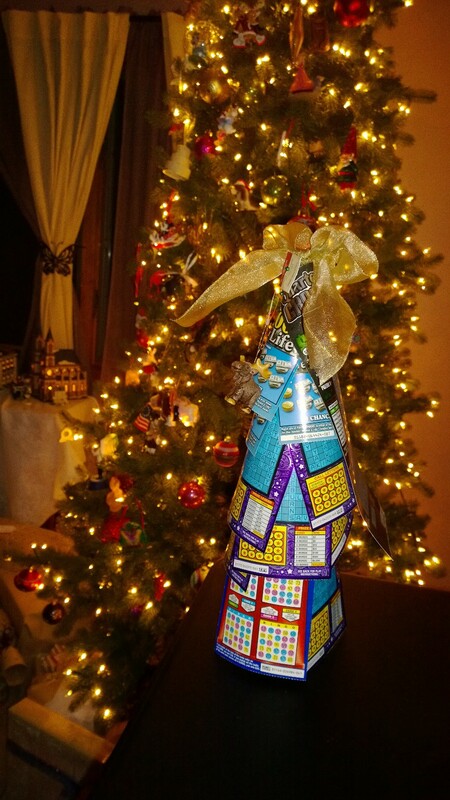 I picked up a foam cone and some sewing pins from Micheal’s and made a ticket tree! This was super easy. 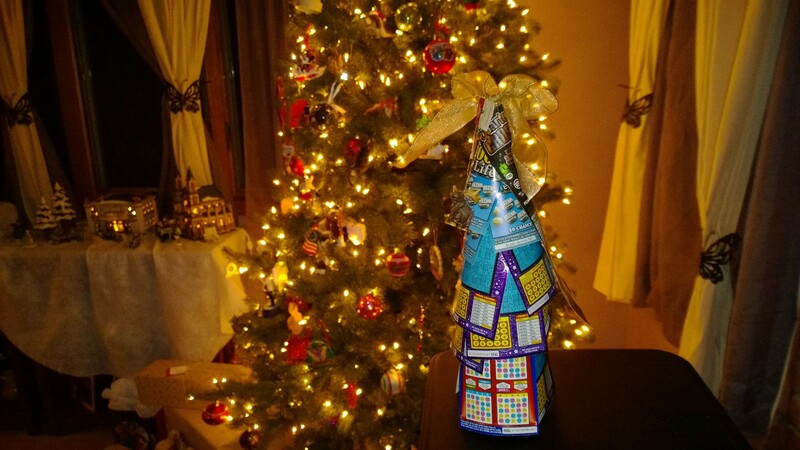 Just wrap the tops of the tickets around the cone and pin the corners down. Overlap and flare out all the tickets to add texture until you get to the top of the tree. I topped the tree off with a bow, and I also pinned on a moose ornament (my Dad’s nickname is Moose). Simple, quick, and cute!